So what kind of hoaxes have the Chinese been perpetrating? Let’s look at one of the primary greenhouse gasses, carbon dioxide. There has always been naturally occurring carbon dioxide in the atmosphere through ice ages and through recovery from ice ages. Over the past 400,000 years ice age carbon dioxide was around 200 ppm (parts per million.) Ice age recovery levels were around 280 ppm. The last ice age ended around 7,000 years ago and the Earth entered today’s modern climate era. Carbon dioxide levels began to rise, but then something unprecedented happened – Homo sapiens thrived under the new climate conditions and the march towards global industrialization began in earnest and the rise in carbon dioxide levels has not looked back. In fact, it correlates perfectly with globalization – beginning a never-before-seen spike coinciding with the Industrial Revolution and continuing to rise with the globe’s increased appetite for fossil fuels. In 1950 carbon dioxide levels in the atmosphere surpassed 300 ppm for the first time in more than 400,000 years. In 2013 carbon dioxide levels reached 400 ppm for the first time in recorded history and it’s still rising. The results – the Earth’s surface temperature has risen by more than 1.6 degrees Fahrenheit since the middle of the 19th century with the largest spike coming in the past three to four decades. The five warmest years on record have occurred since 2010 – 2016 being the warmest year on record to date. More hoaxes? 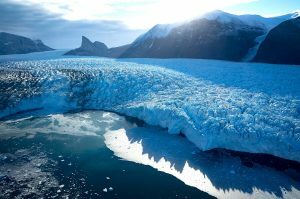 According to NASA’s Gravity Recovery and Climate Experiment, Greenland has lost an average of 281 billion tons of ice each year between 1993 and 2016. Antarctica has loss more than 119 billion tons during the same time period and the rate of ice loss in Antarctica has tripled over the past decade. Sea ice has been decreasing for the past 30 years at a rate of about 3.2 percent per decade. Spring snow cover in the Northern Hemisphere is shrinking from a double whammy of less snowfall, on average, and earlier melting. Scientists in the U.S. believe the reduced snowpack was one of the main contributing factors to the extreme drought that began affecting California in 2011. According to a National Geographic article the famed snows of Kilimanjaro have melted more than 80 percent since 1912. The world’s glaciers are receding at an unprecedented rate. According to one study three times all the ice stored in the European Alps is being lost globally every year. Here in the U.S., famed Glacier National Park is becoming Where the Glaciers were National Park. When the park was created there were thought to be 150 glaciers in the park. Today there are 25 and they are rapidly receding. And where do you think all this melting ice is going? Yep, global sea level rose nearly eight inches in the last 100 years or so and the rate of sea level rise has nearly doubled in the last two decades and has been rising every year. Decades ago, when scientists began modeling global climate change they made some (then) startling predictions like sea level rise, loss of sea ice, more drought, longer more intense heat waves, more extreme precipitation events and more…but what do scientists know? It’s all just a hoax, right? We will delve into this hoax a little more in the next (Oct. 24) Naturalist’s Corner with some real time global warming effects.